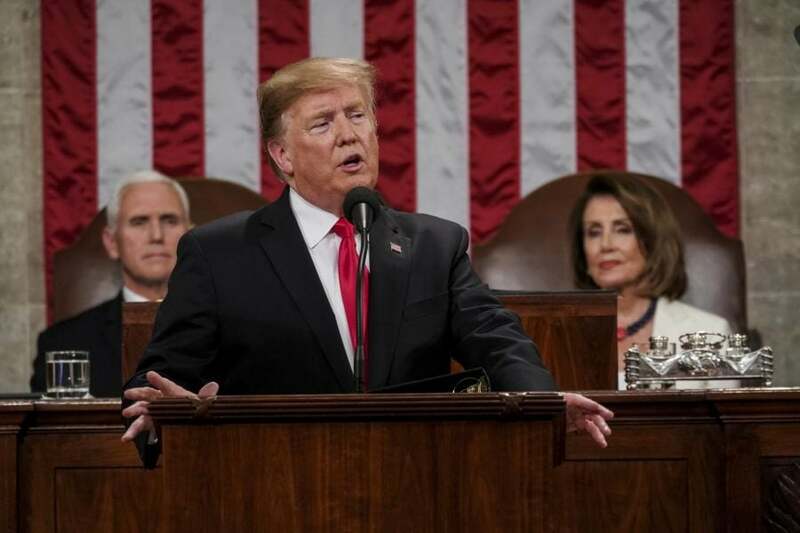 President Donald Trump called the state of the union “strong” during his Tuesday address to Congress and the nation. In the 82-minute speech, which is the second longest in American history, President Trump reiterated familiar talking points including the defense of American jobs, improving infrastructure, reducing healthcare costs, fair trade deals, “America First” foreign policy and increased funding for border security. The latter point was perhaps the most contentious in the halls of Congress. The 35-day partial government shutdown was mainly due to Congress not wanting to pass a budget that included money for a wall on the southern U.S. border with Mexico. Congressional Democrats, led by House Speaker Nancy Pelosi, have fought back against the taxpayer-funded border wall and its $5.7 billion asking price. On Tuesday, the president called for unity, saying, “victory is not winning for our party; it is winning for our country.” He touched on issues of common ground with Democrats, like paid family leave, funding for HIV and AIDs research and increased infrastructure spending. DePaul political science Professor Wayne Steger, however, cautioned that appeals for bi-partisanship can have ulterior motives. “Most calls for bi-partisanship are not a call for compromise, but a call for the opposition to stop fighting and agree to whatever the speaker wants to promote,” he said. Another contentious moment came when Trump took a shot at Democrats for their “ridiculous partisan investigations,” a reference to the ongoing probe into possible collusion between the Trump team and Russia during the 2016 presidential campaign, as well as investigations by the House Intelligence and Oversight committees. Trump argued in his speech the investigations against him and his campaign would hurt U.S. economic growth if they continued. While it may have surprised some that the president would bring up such a topic in a room filled with the very people who have the power to investigate him, it is not a new strategy, according to Steger. “Republicans had been extraordinarily hostile and aggressive about investigations of Democrats when they have controlled the House of Representatives,” he said. “They had 7 different investigations of Hillary Clinton, which they used to lower her approval ratings and keep reminding the public why Hillary Clinton was not to be trusted or liked.” He added that investigations against one’s own party are almost always perceived to be partisan. The State of the Union address did feature a few moments that got widespread applause. One was when Trump addressed all the new faces in the room, including 42 women who joined Congress in January. Many of the women in Congress were wearing white in a tribute to the U.S. suffragists during the 20th century. After the acknowledgment, many of the women and members from both sides of the room stood up and chanted, “U.S.A.! U.S.A.!”, one of four such times during the speech. Another large applause came when Trump introduced Grace Eline, a childhood cancer survivor, as one of his guests. As the audience cheered, he pledged to fight childhood cancer with more funding for cancer research. And a standing ovation followed Trump’s introduction of Judah Samet, a survivor of both the October shooting at the Tree of Life Synagogue in Pittsburgh and the Holocaust. The reaction was mixed from DePaul College Democrats president Irese Obasuyi, who said the speech “wasn’t the worst Trump speech” she’s ever seen. After the State of the Union Address, the Democratic rebuttal was given by former Georgia gubernatorial candidate Stacey Abrams. Her speech attacked what she said was the president’s agenda of keeping the government hostage over border wall funding. She also brought up voter suppression, saying, “The foundation of our moral leadership around the globe is free and fair elections, where voters pick their leaders — not where politicians pick their voters.” DePaul communications professor Kristen Pengelly said this has been a rallying cry for Democrats over the past year. “The Democrats made voter suppression a priority this year with their first bill, the ‘For the People Act,’ so it was great to see consistency,” she said. Before Trump’s address, the White House made it clear the focus of the State of the Union address would be on unity, with senior Trump adviser Kellyanne Conway saying on Monday that the president would call for an end to “resistance, retribution and … comity.” While Pengelly said “unity” is still a divisive topic in Washington,” the spotlight will now be on both the president and Congress ahead of a Feb. 15 funding deadline to avert another government shutdown.